StreetLights for when it's dark outside. Win 7/8/10. Userpic with all my WB's. Want to use it? Just follow the easy instructions included. Enjoy. Loving this one Dave, you really done an awesome job! Love the Taskbar & start menu Real Cool thanks for sharing awesome work! Mike, Greg, Don, Jake. Thank you all very much. Now that is a really great piece of work Dave! Thank you Nikos very much. Good job Dave! Love me some dark skins!! Well done, Dave, this is a great dark theme that'll grace my desktop for a while now. Thanks for sharing, bloke. Barb, Jim, Mark. Thank yu very much. 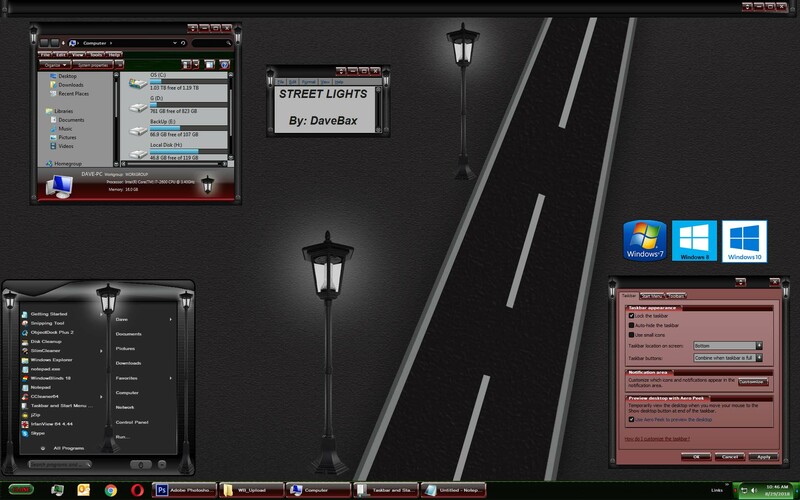 This is cool Dave, love the look of those street lights. wow. Now I can use my lappy with the lights off. Thanks DB. Nice DaveBax Is that wallpaper available? vic wall came with the WB. Look for it using windowblinds. Open WB and apply skin. click on "Wallpaper" You will see it there. NOTE: You will only see the wall if you have the WB it came with loaded.